Experience the majesty and might of a classic steamship voyage in the early 1900’s! Our original tour. Takes visitors through the two main decks where they see the ship from the perspective of both the passengers and wait crew. Includes visits to the dining room, kitchens, ladies smoking lounge, crew’s quarters, passenger state rooms, Flower Pot Lounge, bar and ballroom. Our most popular tour. Combines the Upper Decks and Engine Room tours for a true sense of the majesty and might of turn-of-the-century (Edwardian-era) passenger steamships like Titanic and Lusitania. Comprised of the grain holds, coal bunkers, Scotch Boilers and a working 3200 horsepower quadruple expansion steam engine similar to what was on the Titanic and the last one in the world in existence. The original equipment on display includes the ship’s wheel, binnacle, telegraph, radar, and more. The Wheel House is located two stories above the top deck, and is accessed via a pair of 13 rung exterior ladders. A view of the Captain’s Quarters is included on the way. 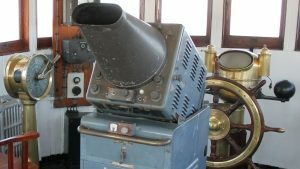 A visit to the Wheel House affords not only a glimpse of the piloting tools, but also a view forward into the Severn Sound and aft over the top deck… with its 10 newly restored lifeboats… into the harbour. Excellent photographic opportunities.